Raleigh area drivers are enjoying a faster commute and smoother drive thanks to the completion of a $49 million highway widening project recently completed by the North Carolina Department of Transportation — on time and on budget. The NCDOT project widened 6.2 miles of Interstate 40 from west of Wade Avenue to east of the Jones Franklin Road bridge from four lanes to six lanes, and it added new shoulders that were built to the same depth as the roadway to allow for easier expansion of the interstate in the future. The bridges carrying I-40 over Wade Avenue and U.S. 1/64 were widened, so they will have the capacity for eight lanes in anticipation of future widening. "Commuters have been enjoying the benefits of having an additional lane since May 7," said N.C. Department of Transportation Secretary Gene Conti. "Now the remaining work is complete, opening up one of the biggest bottlenecks in the Triangle." S.T. Wooten Corp. of Wilson, the project contractor, eliminated unnecessary lane closures and truckload trips to the project during construction, by using an innovative approach. S.T. 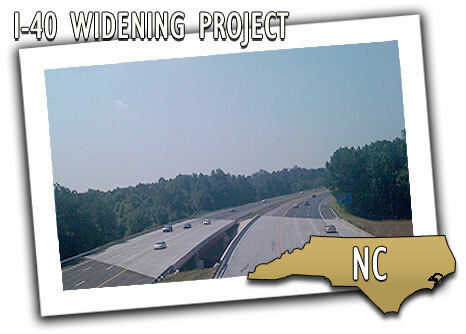 Wooten installed two conveyer belt systems at the N.C. 54 interchange to transport stone and asphalt to the median area. Using this method, S.T. Wooten eliminated 237 lane closures and nearly 12,000 truckload trips that otherwise would have been needed to haul the materials from the I-40 travel lanes.